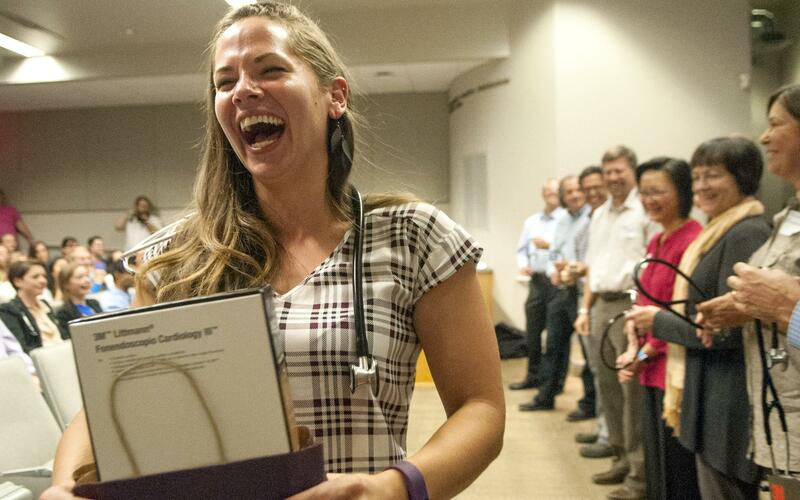 Tue., Aug. 23, 2016, 8:35 p.m.
Sixty medical students in the inaugural class of a collaboration between the University of Washington and Gonzaga University received their first stethoscopes in a special ceremony Tuesday night. The ceremony marked the beginning of their medical studies, but it was much like a graduation ceremony: Each student was called forward to shake hands with local doctors, and some students couldn’t resist flinging up their hands and cheering when their names were called. John Goodman, a graduate of Gonzga Prep, Spokane Falls Community College and Eastern Washington University, was one of those called. He requested Spokane as the place where he wanted to attend medical school. He attended SFCC to become a radiation technician, but two of his instructors encouraged him to consider medical school. After his mother died of lung cancer two years ago, he decided he wanted to be an oncologist. “It’s a difficult field to be a part of, but I keep coming back,” he said. Geoff Jones, a family practice physician in Newport, Washington, is a University of Washington medical professor. He was among the doctors handing out stethoscopes Tuesday and also sits on the admissions committee that interviewed the prospective medical students. All the students have different personal and educational backgrounds, he said. Many of them asked to pursue their medical education in Spokane. The number of medical students in Spokane used to be limited to 20 and rose to 40 last year. The expansion to 60 students and the new partnership with Gonzaga University means that UW is committed to the program, Jones said. The University of Washington used to partner with Washington State University to offer medical education in Spokane, but that lengthy partnership ended when WSU announced plans to launch its own medical school. The new partnership means that the students will be housed in a single building on the Gonzaga campus instead of scattered across the Riverpoint Campus. That, plus the small class sizes, will help create a cohesive group, Jones said. The new partnership is significant for both universities, said John Sklut, chief of staff to Gonzaga president Thayne McCulloh. “It’s an exciting time for both schools,” he said. Sklut said he’s looking forward to seeing how the program will grow and integrate with the undergraduate students on campus. “This is their welcome to the family of physicians and Gonzaga is thrilled to play a role in that,” Sklut said of Tuesday’s ceremony. Published: Aug. 23, 2016, 8:35 p.m.